The war-time work of famed equestrian artist Sir Alfred Munnings is going on show for several months at Britain’s National Army Museum. Munnings was one of Britain’s most celebrated equine artists. The exhibition Alfred Munnings: War Artist, 1918 features more than 40 original paintings from his time with the Canadian Expeditionary Force during the First World War. Displayed together in England for the first time in a century, the impressionist paintings cover equine subjects, portraiture and pastoral landscapes. They highlight the role of horses in military operations, capturing their beauty in the war-affected landscapes of France in 1918. Munnings was just finding fame as a portraitist and painter of British rural life when the First World War broke out in 1914. Blind in his right eye, he was denied a role in the Army on medical grounds. But, in 1918, he seized the opportunity to go to France as an official war artist working for the Canadian War Memorials Fund. 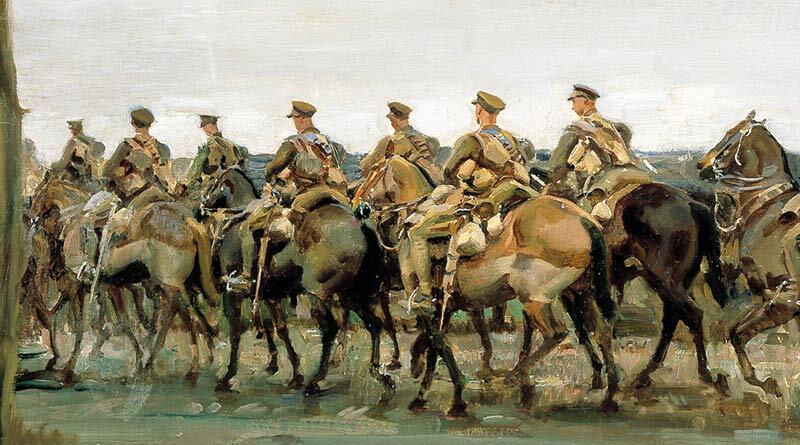 Munnings provides an insight into the men of the Canadian Cavalry Brigade and the Canadian Forestry Corps. In early 1918, he was embedded with the Canadian Expeditionary Force, an army comprised largely of citizen soldiers fighting on the Western Front. The Canadian War Memorials Fund was created by Lord Beaverbrook to document and memorialise the Canadian war effort at home and overseas through paintings and sculpture. Racing’s Juddmonte Group is the local sponsor of the exhibition, and CEO Douglas Erskine Crum said it was delighted to support the unique showcase of works by one of the country’s finest equine artists. » Several talks and workshop are taking place during the exhibition, from November 30 to March 3, 2019. Scroll down this page to find out more.